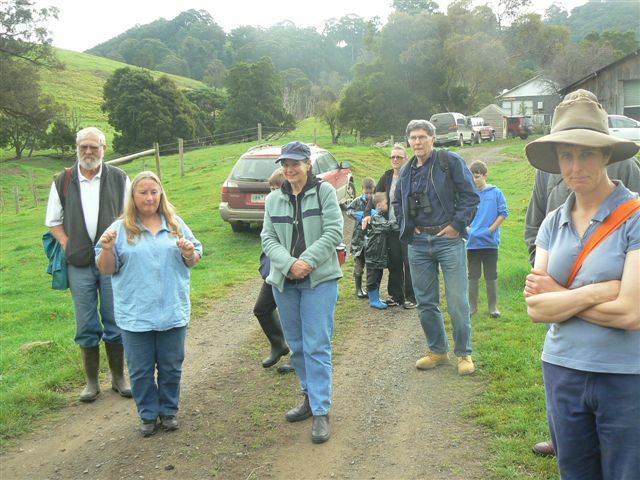 On 22 April Margaret Ferguson gave the group the royal tour of her 150 acre property. Marg brought the property just a few years ago and it was in rather poor condition. Marg has put a lot of time and dedication into this property with projects such as arresting of serious erosion. There are still some areas requiring further work. She has fenced off an extensive length of gully to protect existing native vegetation and allowing regrowth. This gully is very healthy. Large areas of blackberries have been eradicated and she is tirelessly working to control the ragwort infestation. The property now displays some very healthy pasture grasses which support Marg's herd of beef cattle and one goat. The property is bordered by a creek and a property of native bush adding to the atmosphere of the property. We were lucky enough to see Marg's resident koala and Dallas's bird count got to over 20 consisting of a mixture of water, field and bush birds. A lovely part of the world and thanks for sharing it with us Margaret. Margaret explains some of the aspects of her property. Left to right Roy, Margaret, Fergus, Kath, Leo, Charlie, Shellie, John, Oscar, Dallas and Jenny and Kaye behind the camera made up the group on the day.